Once our decision was made to stay in cooler climbs this late autumn, we figured that urban areas rather than the countryside would be the way forward (less mud, warm lunches, museums, scooting, etc...). As it turns out, our first foray into the wilderness was absolutely fantastic. The weather (like all our trip so far) was appalling, but even with rain coming down the Müllerthal area of Luxembourg is stunning!!! For the geologically minded; the area is made up of a sandstone plateau which was a Jurassic sea bed. The sandstone was fractured during its uplift/compression, then wind, rain and rivers worked their magic. The result are some extraordinary rock formations, cliffs and canyons. 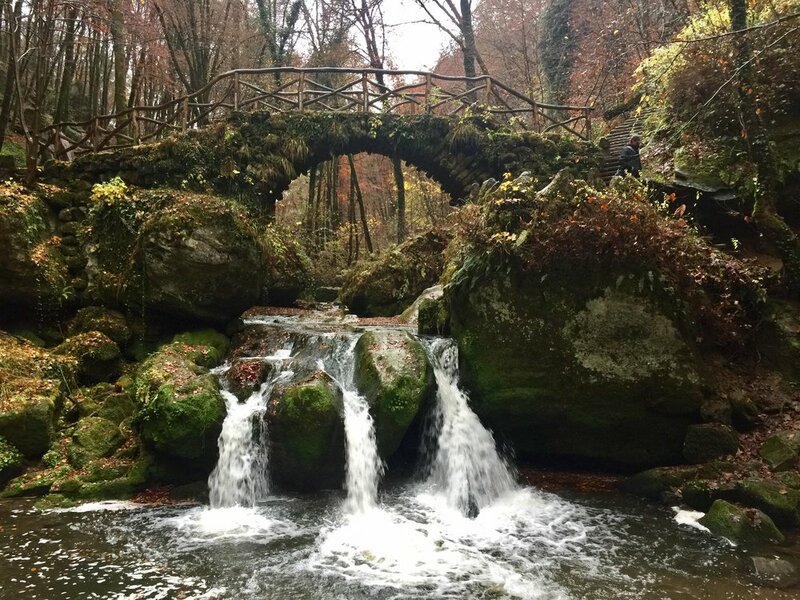 Because of the area's beauty, it is fabulously maintained, there are hiking paths running across the entire region going up and down valleys, up to castles, and through caves and canyons. We managed a beautiful 3-4km walk with the kids but coming back to do one or all of the Müllerthal trails is now on my bucket list. Considering they run to 110km this may have to wait a little while.